Credit scores can be limiting and in some cases, misleading, because they don’t take into account a consumer’s full financial life. For instance, a consumer might have a high credit score while also struggling financially and vice versa. Financial service providers will find it worthwhile to look beyond the credit score to potentially capture a wider market and play their part in helping consumers improve their financial health. Recent research from the Center for Financial Services Innovation (CFSI) identified segments of consumer financial health in the United States. (Note: the author is a manager at CFSI). People in the Healthy segments are able to manage their day-to-day financial lives, have the ability to weather ups and downs, and are better positioned to seize financial opportunities. People in the Coping and Vulnerable financial health segments are struggling in these areas. However, this it is not always a perfect match. For some consumers, their credit scores and their financial health are actually misaligned. There are people in the Healthy segments that have subprime or deep subprime scores, and people in the Vulnerable segments with prime and super prime scores. These individuals represent two key missed opportunities for financial service providers if they only look at consumer credit scores when making lending decisions and generally evaluating a customer. Missed Opportunity #1: If you only look at credit scores, you may miss the opportunity to serve your customers in a comprehensive manner and help them maintain their high credit scores. 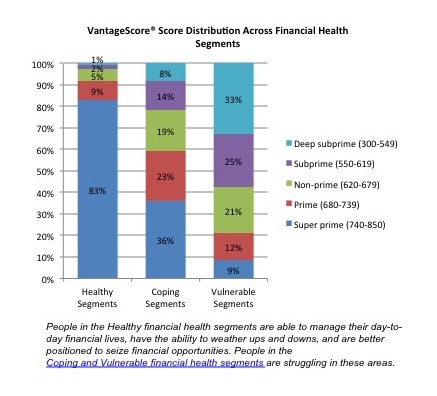 High Credit Scores & Low Financial Health: Twenty-one percent of the people in the Vulnerable segments (who consented to have their credit score range pulled) have a prime or super prime VantageScore® score. These individuals are more likely to struggle with their day-to-day finances such as paying bills, to have little or no financial cushion, and to not be prepared to seize financial opportunities. Yet, according to their credit scores alone they look like a great credit risk. Why the high score? Perhaps while they juggle their bills often, they manage to pay them on time; perhaps they have just opened their first credit card and are starting to experiment with it; or perhaps they have struck the right utilization rate that helps boost their credit scores. This might fit the description of someone you know. While she is able to get that credit card, or get that good rate on her loan, perhaps she isn’t really confident about her money management abilities and is vulnerable to damaging her score in the future. In fact, 55 percent of people who are in this group neither agree nor disagree that they are “good at dealing with their day-to-day financial matters,” and an additional 9 percent disagree with this statement. Wouldn’t you want her financial services provider to help boost her confidence in her money management, offer her services that would address her financial challenges, and help her KEEP her high credit score? Missed Opportunity #2: If you only look at traditional credit scores when making credit decisions, you may be denying credit to individuals who are a good risk. Low Credit Scores & High Financial Health: 3 percent of the people in the Healthy segments (who consented to have their credit score range pulled) have a subprime or deep subprime VantageScore® score. Individuals in these segments are generally able to manage their day-to-day finances, have a financial cushion, and are better positioned to be on a path toward financial security and mobility. Yet, they look like a bad credit risk according to their credit score. Why the low score? Perhaps there is an error on their report; perhaps a mistake in their past or past medical debt is still haunting them today; or perhaps they had a significant life event in the recent past. (A quarter of people in the Healthy segments with a subprime or deep subprime score lost their job in the last 5 years, versus just 7 percent of all the people in the Healthy segments who provided consent to pull their score). You might know someone like this, too. She is denied credit that she and her family could have benefited from, and she could have repaid it without an issue. Wouldn’t you want her provider to give her a chance? Financial service providers have opportunities to both help consumers and benefit their business if they look beyond the credit score and assess a consumer’s full financial life – in other words, her financial health. Nancy Castillo leads the development and implementation of the US Financial Diaries and the integration of research findings into CFSI work. CFSI partnered with GfK, a global market and consumer research firm, to field the Consumer Financial Health Study survey. E-mail invitations were sent to a random sample of GfK’s KnowledgePanel® participants from June – August 2014, yielding 7,152 survey respondents. Respondents were offered a $10 incentive to provide consent to pull their credit score range. We appended two objective measures of creditworthiness to the dataset: Experian provided VantageScore 3.0 credit scores, and LexisNexis® Risk Solutions provided RiskView™ scores. This analysis excludes unmatchable and unscoreable individuals. For more information about the survey instrument, methodology, and financial health segmentation download the segmentation whitepaper: bit.ly/ConsumerFinHealth. For more information about the credit score analysis, download the credit score whitepaper: bitly.com/creditscorecfsi. (Equifax®, Experian and TransUnion®) and, in addition to tradeline data, includes rent, utility and cell phone payment data when it is available in consumer credit files.